Stainless steel case with a steel link bracelet. Fixed stainless steel bezel set with 24 diamonds. Mother of pearl dial with silver-tone hands and stick hour markers. Date display at the 3 o'clock position. Minute markers around the outer rim. Japanese quartz movement. Scratch resistant mineral crystal. Stainless Steel case back. Case diameter: 26.3 mm. Case thickness: 7.4 mm. Deployment clasp. Water resistant at 30 meters / 100 feet. 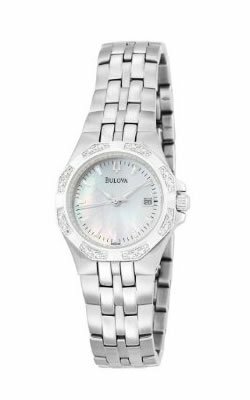 Bulova 24 Diamond Case with a Mother of Pearl Dial Womens Watch 96R126.